Today we made a Spooky Footprint Bat flying over the moon. I overlapped the heels to make the head and used a pinkie finger for the eyes. To make the circle shape of the moon, I found a circular-shaped object and traced around it. 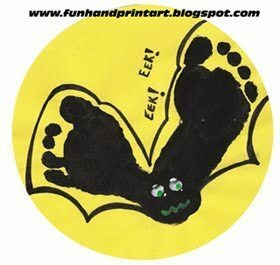 You could also trace the feet on black construction paper and then cut & glue the 2 feet together for a different Footprint Bat Craft. Just glue the head area to the moon and your bat will fly! How cute is that? I will have to bookmark it for us to do!